Celebrating this significant moment, Flatfoot is offering Durban audiences a full-length season of new dance theatre work that is sure to solidify its longevity for another 16 years. With a reputation of edgy, controversial, beautiful and intelligent dance, Flatfoot has titled its 16th anniversary season UNDER THE SAME SKY. Diving heart first into the zeitgeist of contemporary South African identity, this remarkable season asks us to remember our humanity and the place that art holds in teaching resilience. 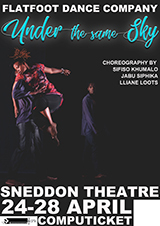 This season premiers three new dance works by Sifiso Khumalo, Jabu Siphika and Lliane Loots. Tickets are R85, with a discount price of R65 available at outlets for students, scholars and pensioners. Advance booking is through Computicket (0861 915 8000 or www.computicket.com or any Checkers Money Market Counter).